Luxury trips at the expense of dictatorships, servitude to autocrats and censorship of inconvenient journalists in the eve of the election of a new Secretary General of the Council of Europe – the prestigious German magazine “Der Spiegel” sheds light on backstage dealings of this European institution, legitimizing grave violations of human rights and European values. The presentation of Bivol and Balkanleaks at the World Forum for Democracy 2013 is quoted as an example of censorship. In November 2013, Assen Yordanov and Atanas Tchobanov presented before the Council of Europe tangible results of investigative journalism – the so-called “Buddha” file about the criminal past of former Prime Minister Boyko Borisov and the infamous European grant received from Monica Yosifova – wife of the President of the Party of European Socialists (PES) and of the Bulgarian Socialist Party (BSP) Sergei Stanishev. After “royal” intervention, the video from the presentation was drastically censored. Politically embarrassing passages were cut without explanation. Bivol officially protested this unprecedented censorship before the Council of Europe and international organizations for the protection of freedom of speech, and is exploring the possibility of a lawsuit in the European Court of Human Rights (ECHR) in Strasbourg. 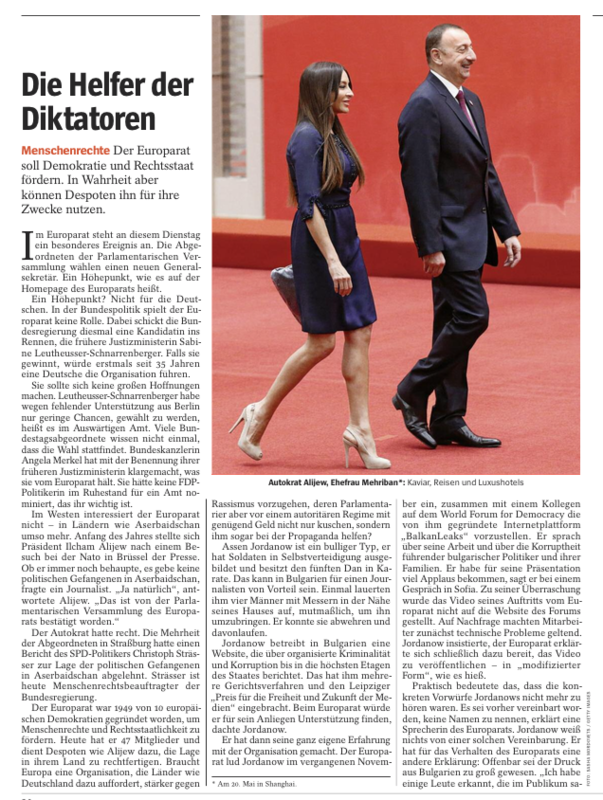 We present in English the full article from “Der Spiegel”, published on June 22, 2014. The Council of Europe should promote democracy and human rights. In reality, tyrants use it for their own purposes. This Thursday, a special event is scheduled in the Council of Europe. Members of the Parliamentary Assembly are going to elect a new Secretary General. High point, as it is written on the website of the Council of Europe. High point? Not for Germans. In German politics, the Council of Europe plays no role. This time, the federal government has a candidate in the race – former justice minister Sabine Leutheusser-Schnarrenberger. If she wins, a German will lead the organization for the first time in 35 years. But she should not harbor major illusions. There is talk in the Foreign Affairs Ministry that due to weak support from Berlin, Leutheusser-Schnarrenberger has almost no chance of being elected. Many of the lawmakers in the Bundestag did not even know that elections were going to be held. With the nomination of the former justice minister, Chancellor Angela Merkel made it clear what she thinks of the Council of Europe. She would never have nominated a retired politician of the Free Democratic Party (FDP) to a post that is important for her. The autocrat is right. The majority of MEPs in Strasbourg rejected the report of the German Social Democrat, Christoph Strasser, on the situation of political prisoners in Azerbaijan. Currently, Strasser is representative of the German government on human rights. The Council of Europe was established in 1949 by 10 European democracies to promote human rights and the rule of law. Today, it includes 47 members and serves dictators such as Aliyev in justifying the situation in their countries. So, does Europe need an organization that calls on countries such as Germany to act more firmly against racism, while parliamentarians just roll meekly before an authoritarian regime with enough money, and are even assisting the dictator in his propaganda? Asen Yordanov is a tough guy; he has trained soldiers in self-defense and has a fifth Dan in karate. For a journalist in Bulgaria that could be helpful. Once, four men with knives attacked him near his home, presumably to kill him. He was able to resist and to save his live. Yordanov is managing a website in Bulgaria that writes about organized crime and corruption in the highest echelons of the State. This brings him many lawsuits, but also the Leipzig Media Award for freedom and media future. Yordanov expected to find support from the Council of Europe for his activities. His experience with the organization ended up being quite peculiar. Last November, the Council of Europe invited him to present before the World Forum for Democracy, along with a colleague, the internet platform BalkanLeaks, which he founded. In the conference hall he talked about his work and the corruption of leading Bulgarian politicians and their families. His presentation then gathered much applause, he said during a conversation in Sofia. To his surprise, the video of his performance was not uploaded on the website of the forum of the Council of Europe. When he asked why, officials first indicated technical problems. Yordanov continued to insist and the Council of Europe finally committed to publish the video, but in a “modified form” as the explanation was worded. Perhaps he would have been less surprised if he had spoken beforehand with Strasser. Despite numerous inquiries, Strasser did not get permission to visit Azerbaijan after all. Eventually, he met in Berlin with human rights groups, lawyers and members of the opposition to gather information for his report. He was able to find evidence that there are dozens of political prisoners in Azerbaijan. But that did not impress the majority of the lawmakers in the Council of Europe; the report was rejected by 125 votes against 79. How come an organization, founded to protect human rights, is siding with an autocratic regime? The European Stability Initiative (ESI), a think tank based in Berlin, has coined on the occasion the beautiful and appropriate term “Caviar Diplomacy”. Authoritarian regimes that have grown rich from oil and gas lullaby foreign politicians with caviar, trips and luxury hotels. German politicians are happy to take advantage of the generosity of Azerbaijanis as well. Former Economy Minister from the ranks of the Christian Social Union (CSU), Michael Glos, traveled with other parliamentarians to Baku at the expense of the local government – including business class flight, luxury hotel, gala dinner, and, to top it off, a speech of President Aliyev. In the past, the former MP from the CSU in the Bundestag, Eduard Lintner, was in charge of the Council of Europe’s reports on the situation with human rights in Azerbaijan. He did such great job that he rose to manager of the Association for Support of German-Azerbaijani Relations in Berlin. This is a lobbying organization, financed by Baku. Parliamentarians in the Council of Europe side with Azerbaijan for different reasons. Russian MPs and most of their Turkish colleagues voted together with Azerbaijanis against Strasser’s report. MPs from Spain and Italy, and Britain’s Tories often join this “grim alliance”, as it is called in Strasbourg. Last October, Aliyev was re-elected president. Partial results and turnout data were released by the Azerbaijani electoral body on the day before the election – ostensibly due to technical oversight. The Observers from the Organization for Security and Co-operation in Europe (OSCE) established threats against the opposition, restrictions of the right of assembly, unequal access to media and disturbingly high number of irregularities on Election Day. A delegation of the Council of Europe, however, came up with a completely different conclusion: The elections were free, fair and transparent, said the Head of the German group and member of the Christian Democratic Union (CDU), Axel Fischer. He was in the country on Election Day and during his visit of a voting poll, he had not seen anything wrong, he says. “The ease with which Azerbaijan could demoralize the Council of Europe is shocking,” stresses the Chairman of the ESI think tank Gerald Knaus.